Official or not does not much matter when it is 96 degrees and 72% humidity with no breezes and no ocean to cool one off. Sure seems like the tropics are here, today, checking us out for some later hurricane activity…. Like RVers checking out campgrounds for future visits. No an outside day, for sure so I turned to inside tasks like, finding the power brick for my printer. As usual, I stumbled across it up in cool, breezy West Virginia (See, I can change my mind) and put it in a “special” place so I would have it readily available. I think my special place was pitched out because I can’t find it anywhere! 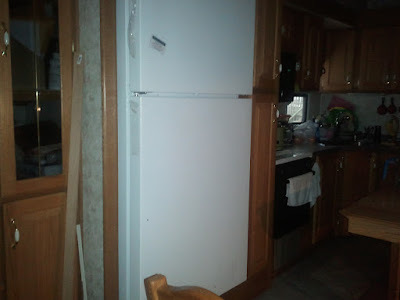 So other stuff is trying to fit the oak door panels from the Norcold RV refrigerator onto the household refrigerator we replaced it with. Got to do something about that great white whale sitting in the middle of DaKotR. It is absolutely wonderful, functionally, but aesthetically…. not so much. Also, I have still not heard from Progressive about my A/C that was damaged in the Tornado in Smithfield, NC on 4/16 so I guess I am going to have to get pushy with them. Dr. visit #1 went fine, today, Dr. visit #2 is tomorrow but I don’t expect any surprises other than some med changes. We will see. I am working on getting comment capability on this new blog site as it is really coming together well and I am sure I will continue with it.